I started riding my bike about a month ago and I can tell you the feeling is amazing. I started with walking, which was great and I still love it and I was meeting my 1000 point goals on my Misfit Flash(Check out my review of the Misfit Flash). But soon I realized that although walking was great at first and I was building up my stamina, I needed something faster. I was fond of running many years ago, but running just doesn’t feel like a lot of fun now. My bike which I had not used in years was the best fit for what I wanted. I fixed it up a little, filled up air, adjusted the brakes and went for my first ride. Every day I pushed myself further and now I easily go 10K to 15K daily. I will improve this as the days go by and we’re still in spring. So how should you get into action for bike month? 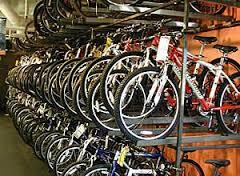 There are many different kinds of bikes. 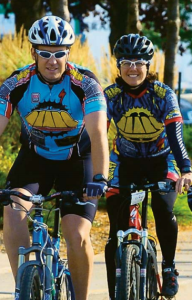 If you are reading this section then chances are you are a just starting off with your biking adventure. Decide what kind of rider you are and how often you will be riding your bike. If you will mostly be using your bike to go to and from work then a hybrid/comfort bike might be the right ride for you. However, if your road to work involves jumping and riding over potholes than a and if you already have a mountain bike then you can simply use that. But please make sure you get it checked and tuned at your local bike shop. If you are serious about riding your bike on the road, setting aside time with the soul purpose of riding, then you definitely need a road bike. There are many different kinds of road bikes and when it comes to price, the sky is the limit. Just check out this $20,000 limited edition Audi Sport Racing Bike. Audi claims the frame of the bike weight less than the iPhone 6 Plus… haa!… That’s crazy – the fact that it costs $20K and that it’s (frame) lighter than the iPhone 6 Plus. To get in-depth information on different types of bikes, I recommend gobiking.ca. If you’re not willing to invest time in reading, you can watch this quick video on how to choose the right bike. I have to be honest here – I never wore a helmet until now. I used to think helmets were not “cool”, but in retrospect, I don’t know why I ever thought that. Helmets can be both for safety and style. 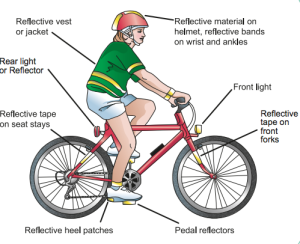 For bikes there are 2 main types of helmets, mountain bike helmets and road helmets. 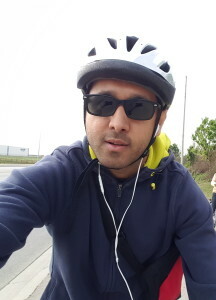 There are also ‘hybrid’-ish type of helmets which lets you clip on and and clip off the visor – I bought this kind when I started off, but now after riding for a some time, I realize that a special road helmet is the best. Whichever type of helmet you get, make sure that it has a light at the back. This will come in handy if you ever decide to right at night or early morning. Check out this video on how to choose a helmet. Before you get out on the road, please check that both your front and back brakes are working. Make sure that there are no loose screws or nuts and bolts. Your seat needs to be adjusted properly to ensure that you have a comfortable and injury free ride. The biggest mistake that people make is having the seat too low. Both your feet should not be flat on the ground while you are sitting – if that happens you’re doing it wrong. Your leg needs to be extended almost fully so that you are efficiently driving power to the wheels. You should also consider the angle in which your saddle sits. If you will be riding at high speeds wearing something comfortable. Don’t wear something that is too loose – it won’t be aerodynamic and will slow you down and potentially throw you off your course which can be dangerous. Don’t wear tight jeans, you need to have free moment in your legs. If you are riding at night, make sure you wear light reflecting outfit and turn on the light at the back of your helmet. I recommend wearing a light jacket to act as a wind breaker especially during the spring or autumn months. Of course you could buy special bike wear but if you are just starting, I wouldn’t recommend this. I personally don’t have any special bike clothing. Check weather conditions before starting your ride. This spring has been crazy – I quickly learnt my lesson. In Ontario, you are not supposed to ride your bike on the footpath. You could be fined if you do. It is also not safe to ride on the footpath. You could easily bump into people and it also becomes difficult for cars coming out of driveways to see you. It is also mandatory that you have a front light so that other vehicles on the road are aware that you are there. Learn proper hand signals. Remember you have the same responsibility as other 4 wheelers on the road. Most of the rules that apply to other vehicles also apply to you. Finally when you are ready, go out there, greet the road with those tires, with the wind in your face and ride…!